The Department of Justice dropped its California case against Apple after the FBI found a way to break into one of the San Bernardino shooters’ iPhone without assistance. 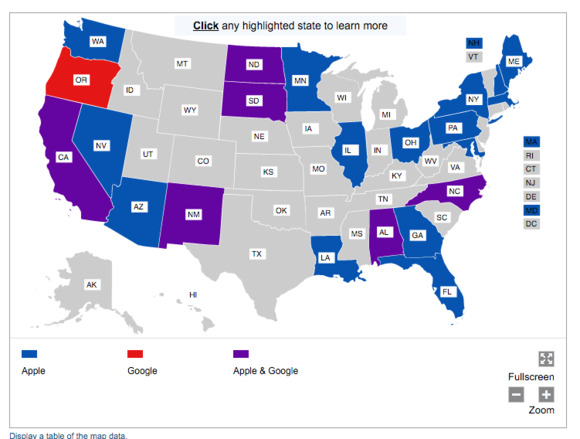 But the American Civil Liberties Union has identified 64 cases where representatives of the DOJ have filed All Writs Act orders seeking assistance from Apple or Google to unlock mobile devices. The ACLU’s numbers are on top of 12 cases identified by Apple lawyer Marc Zwillinger in mid-February, the group said. In seven of those nine Google cases, the DOJ has requested the company’s help with password resets, a different type of assistance than the recent California case in which the FBI wanted Apple to rewrite the iPhone operating system as a way to defeat password protections. In the other two Google cases, the type of assistance is unspecified. Apple has resisted the All Writs Orders in many of the recent cases, according to information from Zwillinger. Beyond the California case, the most active case is in Brooklyn, New York, where the FBI has appealed an order from Magistrate Judge James Orenstein, who ruled that Apple isn’t required to assist the agency in a drug case. The DOJ has said it still plans to use courts to force smartphone makers to help law enforcement agencies unlock devices. The agency filed a warrant in Sacremento on March 1 asking smartphone makers to help break into a terrorism suspect’s phones, Forbes reported.